Gibbs tries to swallow the cherry as lunch is called late on the fourth day of the first test. Gibbs reacted remarkably well when he found out the hard way that part of Australia's "mental disintegration" game against the South Africans involved standing very close by and underarming the ball into the batsman's face. Hodge: "Graeme tells me it's not the first time you've had a ball resting on your chin." Not content with giving away the match, Australia insisted that South Africa took the match ball as well. Brad Hodge was not all that impressed with Gibbs stealing, and subsequently making fun, of Hodge's new limited edition cricket related shaver. 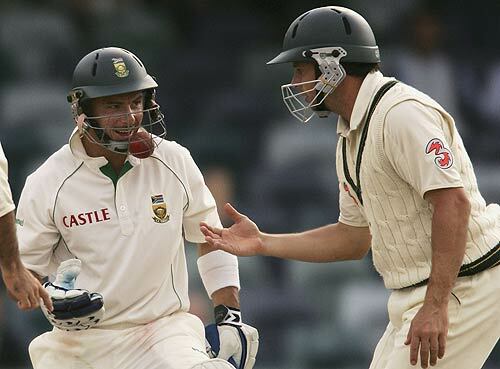 Hodge continued trying to explain the concept of bowling to Herschelle "...no, no, no, you`re doing it all wrong! *holds out hand* You put the ball in there dude... what the hell are you doing?! That`s your mouth man!" Herschelle and Brad played it hard in the first annual 'Full Contact Apple Bobbing Series'.